Add flavor to your favorite songs with easy backup techniques on the autoharp. Bring a TUNED autoharp in good playable condition (no missing or rusty strings), a thumbpick, and two fingerpicks. If you are looking for ideas to accompany your vocals with the autoharp, these simple strums can add a delightful amount of interest to your musical selections. Tina Louise Barr is a virtuoso performer of the autoharp, a multi-stringed American instrument. From the central valley of California, her amazing versatility on the autoharp has earned global acclaim in her field. She performs and teaches group autoharp workshops across the U.S.
Tina performs solo and with her band Hot Wire, as well as with the Brookdale Bluegrass Band. She has been a featured performer and instructor at numerous music festivals, including the Mountain Laurel Autoharp Gathering, California Autoharp Gathering, Willamette Valley Autoharp Gathering, and the Glendale Arizona Folk and Heritage Festival. 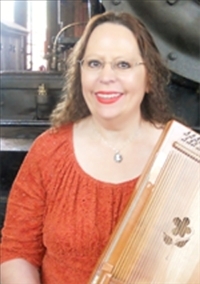 Tina serves as a staff member of the international music publication Autoharp Quarterly. She is a recipient of the Modesto Area Music Association (MAMA) Award, the California Bluegrass Association Service Award, and the California Autoharp Lifetime Achievement Award. She is renowned for concise and dynamic performance that clearly demonstrates recognition of the autoharp as a master instrument.